Rob B. asks: Is the happy Chinese guy picture fake and who is the guy shown? For much of the early history of photography smiling in photographs was almost unheard of for various reasons. (See: When Did People Start Smiling in Photographs?) Despite this, a photo of a Chinese man, dubbed by the masses on the internet, “the happiest man in China”, occasionally makes the rounds purporting to be of a 19th century Chinese man who unabashedly displays a wide, toothy grin for the camera. This, in addition to the man’s remarkably photogenic appearance and near flawless smile, has naturally led many to dismiss the photo as fake- seemingly just a picture someone recently took and digitally touched up to appear like a photo from the 19th or early 20th centuries. So is the “happiest man in China” photo a fake and who is the smiling man? As for the latter question, very unfortunately, nobody knows. We do, however, know the photo is genuine and how it survived through today. 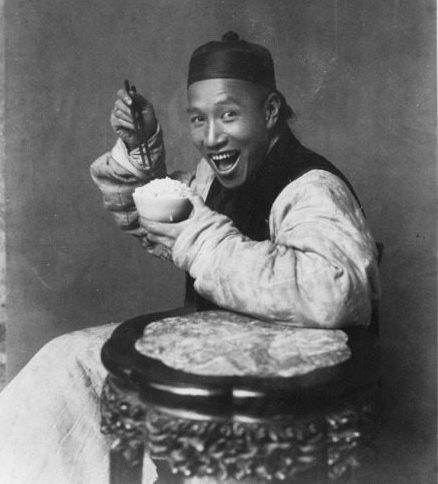 Officially titled “Eating rice, China” (and originally captioned “Chinaman eating rice”), the picture is one of originally 143 photographs (105 of which can be seen here) collated by famed sinologist (more or less “expert on China”) Berthold Laufer who, in 1904, returned from a landmark three year trip to the Orient with about 7,500 objects intended to showcase the day to day life of the average Chinese individual at the time. The ulterior motive here, as alluded to in the letter, was to explore the potential for various business dealings with China, which is how the museum and Laufer got banker Jacob H. Schiff to fund the expedition; Schiff was partnered with various businessmen including railroad magnate E.H. Harriman, former senator Calvin Brice, and J.P. Morgan, all of whom were looking to expand their business dealings into China. an extensive collection of representative objects used in daily life, agriculture, folk religion, medicine, and in the practice of such crafts as printing, bookbinding, carpentry, enamelware, ceramics, and laquerware. Laufer also collected numerous musical instruments, costumes, articles of clothing as well as wax cylinder recordings of traditional Chinese songs and plays. Due to his interest in Chinese theatre, he also ended up returning to the States with the “most extensive collection of Chinese puppets in North America including shadow puppets, rod puppets, and glove puppets in several regional styles”. It’s not clear where Laufer acquired many of the objects he collected, though in most cases it appears he simply bought the items either from antique dealers or the market stalls found in the hutongs of major cities. Although Laufer would claim in a letter home that during his journey “there is no path I do not walkover, no cave I do not enter”, in reality he spent the majority of his time in Peking and despite repeated request from the Museum to interview actual Chinese people, tended to gather his quotes from books. This all brings us back to the photos he acquired during his trip. As he didn’t take a camera with him, it is thought that Laufer himself didn’t take any of the pictures he sent back to the museum. The approximately 143 photographs he did collect were largely purchased from unknown sources, with the American Museum of Natural History admitting that many of the photos Laufer found “are known to be widely-distributed images available for purchase at the time”. Among these images depicting various facets of Chinese life and culture is the aforementioned unknown happy man eating rice. According to the museum, the photo is, as previously noted, a genuine picture from the turn of the century and in their opinion was likely taken between 1901 and 1904- the dates of Laufer’s trip. While it’s sometimes claimed that the man was having his photo taken at Laufer’s request in order to demonstrate the eating of this staple of the Chinese diet, there is no documented evidence that this is actually the case. Further rumors that the man struck his happy pose as he had no knowledge of etiquette in photography at the time can likewise not be substantiated by any documented evidence we can find. All we can definitively say based on available evidence is that the photo isn’t part of some elaborate internet ruse, it was taken sometime around the end of the 19th or early 20th centuries, and it was collected by Laufer and sent back to the American Museum of Natural History during his 1901-1904 expedition.